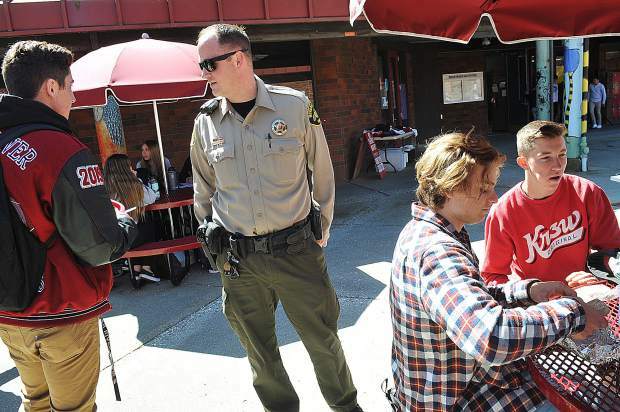 School Resource Officer Tim Highsmith strives to have a close relationship with the students of Bear River High School. Highsmith, along with campus security Ralph Lewis, can be seen conversing with students on any given day. Highsmith even coaches a JV soccer team after school. On the afternoon of Feb. 14, a young man emerged from the back seat of an Uber car carrying a backpack and a duffle bag. He walked into the halls of his former high school and pulled the fire alarm. Within 10 minutes, 17 people were dead. The Stoneman Douglas High School shooting in Parkland, Florida, is the latest act of on-campus violence in a tragic trend that has bloodied America from coast to coast. In this era of senseless and capricious brutality, communities both rural and urban are asking the question: Are our children safe? It is a question Christine Espedal takes seriously. In the four years she has served Nevada County as the school safety climate coordinator, Espedal has worked to ensure plans exist to keep students safe. These plans address best response practices for emergencies ranging from wildfires to earthquakes. But lately parents have a fear far greater than natural disasters: the threat of an active shooter. Due diligence includes updating emergency plans and staff training protocols to align with current federal and state laws and recommendations. “These plans are living documents that we are always looking at and trying to stay on top of,” Espedal said. One of the most important updates to policy is the adoption of the nationally recognized plan for active shooters. The plan, ALICE, is an acronym representing the five elements of active shooter response: Alert, Lockdown, Inform, Counter, and Evacuate. Of those five responses, four are typical and time-honored reactions to school violence. The addition of the “counter” response, however, has redefined the way schools are formally addressing survival in the case of an active shooter event. And with the adoption of the ALICE response and additional training protocols, teachers and staff are learning just what to do. What has become increasingly apparent, however, is that students are not overwhelmed. They are fed up. Last Wednesday, nearly a million students nationwide staged a walkout to protest gun violence. With more than 3,000 registered demonstrations across 50 states, students made known their fears and their strengths. Espedal agrees. For all her training and protocols, the safety coordinator understands that technical details must never obscure emotional truths. Grass Valley School District Superintendent Eric Fredrickson knows this, and works to provide a supportive atmosphere for his students. The agency of students isn’t limited to sharing fears or staging walkouts. At Nevada Union High School, 19 students are active members of the school Community Emergency Response Team, where they learn how best to respond to emergencies. Though the school would never activate their team in an active shooter event — the students would be in lockdown alongside their peers — possessing the technical and emotional competence acquired from Community Emergency Response Team trainings is invaluable to young adults. In extreme events, levelheadedness can save lives. “‘Run, hide, fight’ is the best practice recommended at a federal level and in the state of California,” Espedal said. The mantra is a simplification of the ALICE protocol, but that does not mean it is simple. Performing those three functions during an active shooter event requires composure, a state of mind that is strengthened during trainings such as those offered to students in the Community Emergency Response Team program. Last week, The Union reached out to readers online about what should be done to better protect our schools. One woman responded with a link to a news story about bunker schools in Israel, but Espedal says such an approach does not reflect the values of Nevada County.